The Ed Mirvish Theatre has seen several name changes since its opening in 1920. 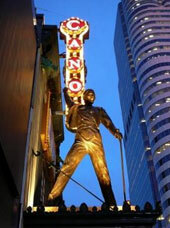 Formerly the Canon Theatre and before that the Pantages Theater, it was named the Ed Mirvish Theatre in December 2011. Special acoustical concerns included the discrete integration of acoustical fabrics and the noise control design of HVAC equipment above and below the theatre. The restored building seats 2200 people and is one of the busiest theatres in Canada.